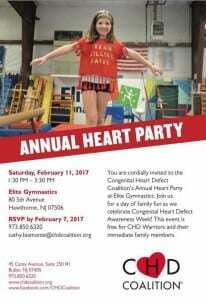 You are cordially invited to the CHD Coalition Annual Heart Party at Elite Gymnastics. Join us for a day of family fun as we Celebrate Congenital Heart Defect Awareness Week! This event is free for CHD Warriors and their immediate family members. Please RSVP by February 7th!